Hello! Just started quilting about 8 months ago with the help of some great work friends who have been patiently helping me along. And I've learned so much from this site. You are a community of wonderful people who build each other up and share your great ideas. So- thank you for that. Now my question - I've read some posts about signing your quilts. What is a common way to do this? Embroidering your initials, sewing on a label? I. Not sure. I just finished my first quilt which I made for my hubby and I'm sure he won't forget where it came from, but I think it's a nice idea maybe when making gifts for other people. How many of you do this? Welcome DawnS. I'm fairly new to quilting too. 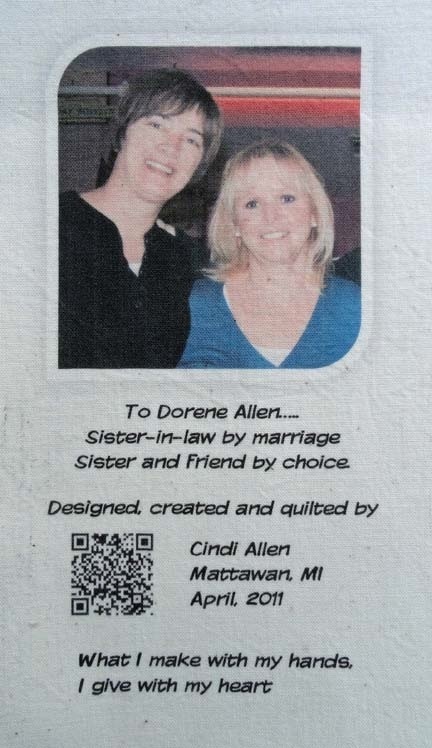 Most definately put a label on all your quilts. Generally, I use a scrap of fabric and hand write (in pencil) the info I want to include. Then embroidery and attach it to the quilt. Several local quilters have told me to include my name, who it's going to (if it's a gift), the date and town/state. This is good to do for history's sake. **wish my Mother had done this with her quilts. or theres anything special about the fabric, i put that on there too. For example, i rescued some blocks at a flea market in VA so i noted that . I also make my labels mostly out of muslin, sometimes framed in scraps of the fabric used on the top. I use permanent fabric markers. It helps to iron the muslin onto a piece of freezer paper. It stabilizes the fabric so it doesn't wiggle around as you write. I usually write out what I want to include on a piece of paper first so I can get the wording and spacing just right before I put it in permanent ink on the fabric. Of course if you mess it up, you can always get another piece of muslin. I usually include the date I completed the quilt (not the date started, lol) who it is for, the occasion, and sometimes include the city and state. You might even include a dedication of some sort, a Scripture verse or a quote that fits the occasion. You have created an heirloom, imagine what sort of information would be interesting to people years from now who might wonder about the quilt's history and you, it's maker. When I see old quilts at estate sales or antique stores, I always wonder who made and if there was a special occasion for it. Why did they choose the colors or pattern, etc. etc. I usually forget. Welcome to the board. When I do a label name of quilt should also be included , date, maker and Laq if different and who it is for. Ie as much info as possible for those in 100 years to trace family history. You can also put on binding and there is a great tute in the tutorial section. Sometimes labels are shown on her or pictures as well. I always include, 1. Name of quilt or wallhanging, who I made it for, bible verse that pertains to the person, event or quilt, date it is finished, my name and city and state. I use card making software and print on fabric. Sometimes I add a picture of my DH and myself if it is a gift from us both!!! I also use muslin and frame it out in the same backing fabric. Sometimes I trace special meanings out of a label book. I also sew it onto the back "before" quilting. It's almost impossible to remove in case of theft. I wanted to post a sample of a label but can't seem to make it work. Since I just finished making two labels this morning, I thought I would post my two cents. Always make a label for a quilt if it only has the name of the quilt, your name and birth date, where you were born, who is getting the quilt (usually leave a line on the label if I don't have an owner in mind), Washing and Drying instructions, (usually mine is Wash: cold/warm and Dry: low/hang). The reason I do this is I have been given quilts from great-grandmothers, grandmothers, aunts on both sides of our family and NONE of them have a label, I have been finding as much info as I can and make a label for each one if only to say: (Smith Grandmother - given to _____ and the date) that way my children or anyone who gets any quilt has some information. I have printed labels on the computer printer - ironed hot; I have taken muslin-used a permanent maker- ironed it; have embrodered it; hand-sewn them on after using a fusible piece to attach them to the quilt. As I use to tell my 4th graders, always put your name on your paper and your stuff!!!! I've been creating labels for my quilts for years- every one- even if it's just for the kids to use for forts & picnics...there are a wide variety of ways to create your labels-- in *my book* the least amount of information should be-name of quilt, your name, city, state & date. I've written special messages on labels, acknowledged special occasions, special people, if I use a commercial pattern I include the pattern designers name; if I have someone else quilt it I include that name- I make quilt labels by designing them on the computer-then printing them off, writing them onto fabric with permanent micron pens, embroidery, I've printed special pictures onto fabric-then written the label over the image...your creativity is your only limit- sometimes my label is large, sometimes small, sometimes hidden behind a hanging sleeve- or written as part of a block or design on the front- even written along the binding so a *story* goes all the way around the quilt. it does not matter how you choose to make your label- only that you do. I (try to) put labels on all the quilts I make, even if they are mine because someday, when I am gone, they will be handed down to family and they will know more about the history of the quilts. This is a link to my post a couple years ago showing a quilt I made for my son and his (then) bride-to-be. (Now my wonderful DIL!!) http://www.quiltingboard.com/picture...l-t103608.html. The second picture shows the label I create in Word and printed on injet printable fabric by Dritz called Printed Treasures. The picture was one of their engagement pictures. I really like using Printed Treasures even if just putting info on the label without pictures. Great ideas. Thanks to all. I, also, really like Printed Treasures. I place a muslin piece face to face, same size, sew, turn, press, hand sew on. I like Sandyquilts idea to frame it and sew it to the back before quilting to help prevent theft. I'm presently quilting a prayer lap quilt, and he might be going to a nursing home. So I will adapt so it can't be taken. I do mine with Bubble Jet Set. I set up my label in Word or Photoshop. I also add a QR code that, if found, can be scanned and it will take the finder to our blog so they can contact me and it can be returned.